So after the previous post where I was sending out a rather large sample, I had a look in to filtering things a bit. The first step in the doorbell example should have been to sample as low as possible to limit it to the minimum sample size. In order to test filtering with GNU Radio, I captured a sample with a short transmission at +100kHz followed by another shortly later at +300kHz using the basic capture flow in the previous post and used this with a waterfall to observe the output. The goal was to filter out the +300kHz signal. Searching for “filter” turned up a low pass filter which sounded about right, with a bit of trial and error with the “Transition Width” which didn’t work when set to 0 or a low figure we can see the output when the filter is set to 500kHz. 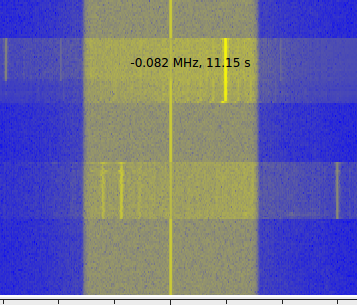 Changing the cut off value to 150kHz shows the following where we can see the +300kHz signal has been filtered out. We can still see the band where it transmits and the signal outside the filter but I assume this is due to the strength of the signal in the original capture. Trying this out adding the HackRF as a sink and listening with another receiver confirms that only the +100kHz signal is being transmitted with nothing heard on the +300kHz frequency. I’d still like to figure out what the transition actually is, if anything at all is being transmitted outside the filter frequency and if there’s a way to have it filter in one direction from the centre frequency instead of both although for my purposes the filter above is enough. Removing /usr/local/share/gnuradio/grc/blocks/band_pass_filter.xml did the trick here to get it working and let the 3.7 filter_band_pass_filter.xml be used. I did this for a couple of the blocks before removing all of the older dated ones, I’ve not seen any problems but a total clean up might be in order prior to a reinstall.